Every year, homelessness affects 200,000 Canadians and costs the economy $7 billion. To make matters worse, homelessness and mental illness often occur concurrently, significantly affecting individuals and communities across Canada. The MaRS Centre for Impact Investing, in partnership with Social Finance in the United Kingdom, wanted to determine whether an alternative funding mechanism could help mobilize capital to address this serious societal issue. We released our findings in a report titled “Housing First Social Impact Bond Feasibility Study,” which assesses the feasibility of using a Social Impact Bond (SIB) to finance a promising intervention for homeless people with mental illnesses. Our independent research, as well as guidance from the Canadian Supportive Housing Working Group, led us in the direction of Housing First as an effective approach to tackling homelessness. Housing First is a recovery-oriented approach that centres on quickly moving individuals experiencing homelessness into independent and permanent housing, and then providing more supports and services as needed. The national At-Home/Chez-Soi study, which employed the Housing First approach, has provided rigorous evidence of impact with details on the economic advantages of the intervention for various segments of the homeless population. Housing First is not inexpensive to deliver, making it critical to refine and quantify the value achieved from investing in it. SIBs help enhance that value: Governments can benefit from using SIBs to share the implementation risk of replicating, scaling or adapting the Housing First intervention with private investors. Furthermore, an SIB could increase the likelihood of delivering positive outcomes by enabling innovation and flexibility, while also introducing discipline and enhancing rigour in service delivery. If the primary desires are to improve service delivery across a range of needs and to improve outcomes for homeless people, an SIB could raise upfront funds from investors to work with a broad population of homeless individuals with mental health issues. Public sector commissioners would pay an outcome tariff that is initially informed by the expected costs of delivering the service, but declines or increases with delivery performance. The outcome payment mechanism would likely be based on housing stability outcomes with minimum service standards required to trigger any payments. 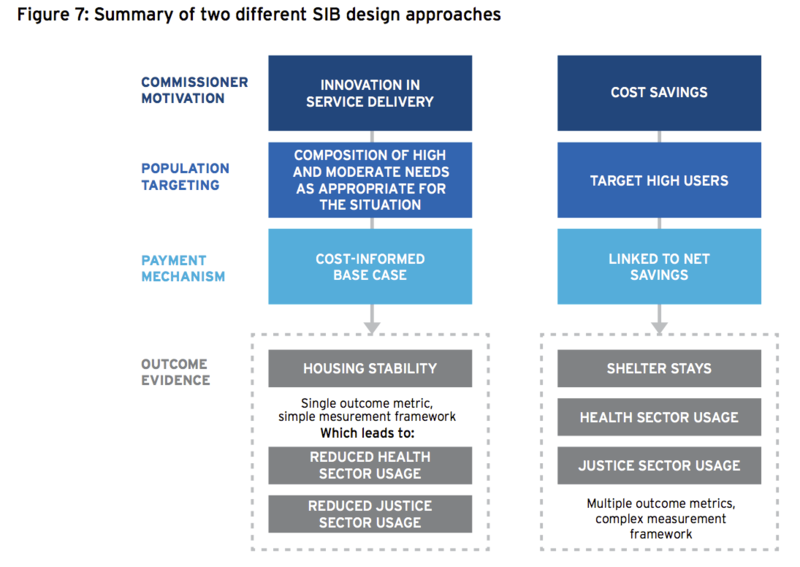 If the primary motivation is to generate cost savings in addition to improving service delivery, the SIB could be structured to target high users of public sector services. Outcome payments would represent a portion (approximately 50%) of the potential cost savings back to investors based on available research and data. The payment mechanism could rely on usage outcomes that are a closer indicator of cost savings. Such an approach would require consideration of potential perverse incentives, as well as an assessment of whether targeting high users fits within government policy. Our analysis looked at several notable variations that significantly influence the amount of capital and cost structure of the SIB model, including caseload (program size), population composition (high needs, high users, etc.) and inclusion or exclusion of rent supplements as part of the SIB-funded service. Investors should consider the Housing First model as fertile ground for an SIB that would offer a means to mobilize their capital for public good. Upfront capital is crucial in order to allow social service providers to run their activities during the SIB period. For investors, this should be seen as a viable opportunity to invest in their communities without forfeiting the possibility of a return on their investment. For my teammates and myself, this project has truly been a unique challenge. The insights and recommendations we ended up with in the report are substantially different from the hunches we had six months ago when we first got involved. For example, our learning around different segments of the target population ultimately allowed us to define different program designs to fit various stakeholder motivations. 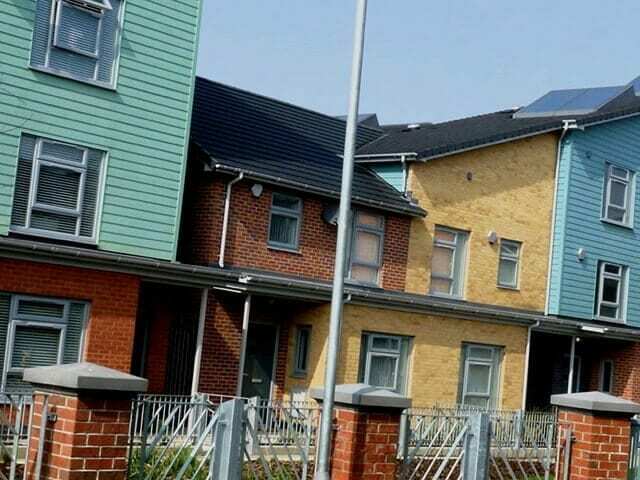 Additionally, in considering identification of a suitable payment mechanism, consultations and site visits introduced us to practical considerations that became critical to our approach in designing a Housing First SIB. My hope is that our discovery process and the report’s feasibility analysis contain transferable elements that will be applied in future SIB projects in Canada and abroad. Read the full Housing First Social Impact Bond Feasibility Study in the MaRS Library. As well, join us at MaRS for the Social Finance Forum on November 6-7 to explore key advancements in social finance around the world and in Canada.